Mary Brown Young is my great grandmother. She was born 7 June 1903 in Carluke, Lanark, Scotland to James Young and Catherine Brown. In October of 1910 she left Scotland with her mother and three siblings and immigrated to America. They lived for a time in Butte, Montana before settling in Spokane, Washington. Mary was just fifteen and a half when she married John Costello 1 January 1919 in Spokane. It has been said that she had ten pregnancies. Every pregnancy ended with a pre-term delivery. Six babies had records generated about them, two were male children with no given name, four lived long enough to be named and of those four, three lived to adulthood. Mary worked for many years as a florist in Spokane. She didn’t drive, so she traveled to and from work by walking and riding the bus. When Mary was just 63 years old her husband died. She lived 31 years as a widow, dying 11 June 1997 in Spokane, Washington. Sometime in her later years she made a trip back to Scotland. There are a few photos of Mary with some of her cousins. And then, there is this photo. A photo that has captured my attention. Something about it tells me that this particular cottage was important to Mary. Important enough to go and stand in front and have her photo taken. I’ve wondered if this was her childhood home or the home of a grandmother. I’ve also wondered if I am imagining the home’s significance to Mary. Maybe it’s just the home of a cousin she visited. But then right after the thought crosses my mind I am once again convinced that this cottage is significant to Mary’s story. And that makes it significant to me. I hope this particular cottage is still standing. I hope I will be able to recognize it when I find it. I hope to one day look at this photo and understand exactly why it is so compelling. Why Mary traveled from Spokane to this spot during her golden years. 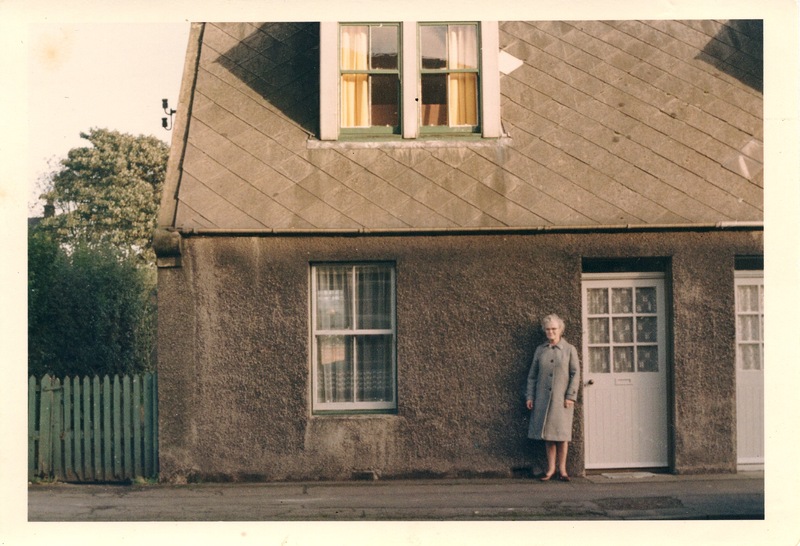 Why she walked up to this cottage and stood next to that door and asked someone to take her photograph. Why did she love this home so much? One day, I hope I will be able to tell you. You always have such interesting posts. I realize I don’t comment much, time is really at a premium sometimes, so I apologize, doesn’t mean I’m not here reading! Do you have a house name or address for where Mary was born? Perhaps it was the house she was born in? Sounds like it might be more likely to be where her parents lived when they went back. I think we all feel that way about being more organised! Thank you Su. I was thinking the same thing about the cousins being in the photo as well. I need to finish compiling my list of possible addresses and spend some more time with google maps. I hope I figure it out too! Yes! I am convinced that our DNA contains a living memory of some sort. I also don’t know how to explain it well but I’ve had experiences that are pretty undeniable. I am mostly English and was able to visit London for a few days several years ago. I had the strangest feeling of coming home while I was there. It really seemed as if my DNA was sending warm fuzzy feelings to my brain and heart to let me know this was where I came from. I’ve heard others express similar experiences. So, I think you may be onto something there. After reading the comments, you’ve done all the things I was going to suggest regarding Google street view and addresses. My other comment is we have to be related in some distant way. My Scottish ancestors lived all over Lanarkshire, including Blantyre, Cambuslang, Carluke, Dalserf, Hamilton, Larkhall, Stonehouse, and so on — name a place. And I’ve got lots of Brown and Young surnames in my tree. My 3x great grandmother, Henrietta Brown (died bed 1856) is one of my biggest brick walls. Ooooh, intriguing! I love playing the ‘How are we related?’ game. I have lots of family from Carluke, many from Dalserf and Hamilton, a few from Larkhall, Cambuslang, and Blantyre. My Brown line is not well researched and stops with Andrew Brown. (I’ll stick the link to a post I wrote about him at the bottom.) My Young line goes back a bit further. I have gobs of James Youngs. I also have Vickers, Boles, Hotchkies, McLarens, Fergusons, and Robertsons – off the top of my head. Interesting as always. I have a dear friend who is from Lanark. She lives in North Ogden.